We can say a lot about wood selection, but I'll try to be brief. When making these projects, we often end up with wood that's very thin; 1/8" is very common. Given that constraining factor, wood whose grain is dense and tight tend to work well. It may be hard or soft, but what's important is how well it holds detail and how crisply that detail is retained. Huon Pine may be very soft, but it hold beautiful detail. 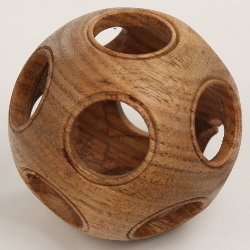 English boxwood is often considered the top wood for these items. It is surely a fine material that every turner should try at some point. You'll also find many other species that are a joy to turn as well. 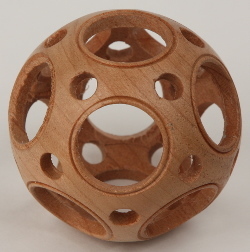 We have many of thse woods availalbe in our store pre-cut into sphere blanks for you to try. At the other end of the spectrum are woods with a wide open grain (that is, wood whose summer and winter growth is very different) that don't work real well (Hoadley's "Understanding Wood" provide a great explanation of why woods are so different in this respect). Examples of woods with wide grain are ash and red oak. Other woods that don't work well are those that are too soft to hold detail well. Poplar is a great example. The color or shade of a wood matters too. I prefer light colored woods so that people can see well inside of them. For a single level and maybe a 2-level ball, darker woods work fine. They're handsome and rich. But as you peer into a multi-level sphere, dark woods make it very hard to see what's going on in there. It's easy to loose the 4th and 5th levels in dark colored woods. 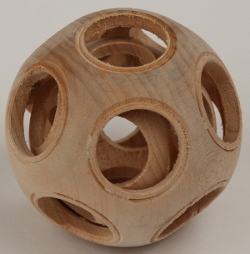 Birch - This is the most likey wood that store-bought balls will be made of. The wood isn't bad and is fairly nice to learn on. It's all-around pretty average. Not really terrible at anything. 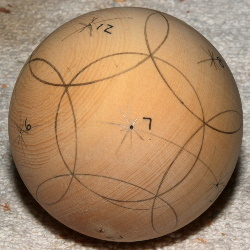 It wouldn't be bad to make your own balls from, but those store-bought ones are likely to be pretty much not-very-round. 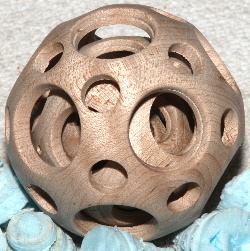 Cherry - A very handsome wood, probably best for 1 or 2-level balls. Cherry darkens with age and exposure to light, so multi-level balls may be hard to see well. Sometimes cherry can be a bit brittle, so be careful with detail. Butternut - Well-regarded by carvers, I thought this wood would cut well. It does, but its grain is to wide to take the detail we're looking for. It also doesn't sand particularly well. It's a fairly good wood for learning the process, but don't expect fine detail or crisp finishing. 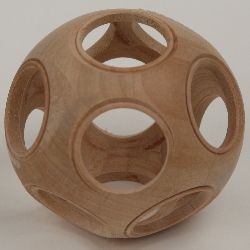 Basswood - This soft and fairly weak wood is a dream to turn. It's very nice for learning and practicing all of these projects. It's readily available and less expensive than some finer alternatives. It cuts very smoothly and holds detail surprisingly well. I still turn to this one for new ideas. When using it, don't bother with the mineral oil-based stabilizers. Maple - There are a lot of good things to say about maple. It's hard, the grain is close and dense. It also has a nice lite color. Make sure your cutters are very sharp for this one, and re-sharpen as you go. Huon pine - This light, dense and very tight grained wood comes from Tasmania, an island off the coast of Australia. It takes the most beautiful and soft sheen when sanded well. It also holds fine detail well. I find it a absolute joy to turn with when I can find some. Not everyone prefers the yellow tint of this wood. Poplar - I used it only becuase it was sitting around my shop. It's really too soft for these projects, and doesn't hold detail well at all. Skip this one.